We somehow got our hands on the Kora linear power supply manufactured by Core Audio Technology. We wanted to take one of their modified Mac Mini's mated with their Kora power supply and compare it to our latest YFS Mac Mini and PS-12m linear power supply combination. That's exactly what we did and you can read about it in the article below. We want to thank one of our great YFS customers for his kindness and his huge heart. Thanks for letting us borrow your personal digital front end for this review. Thanks again Joe! First of all, let's talk about what a lot of folks have been telling us for the past few years. Most folks see our YFS modified Mac Mini and they say, "All computers sound the same, why would I pay for that?" That's a great statement and a great question. Let us explain our thoughts and give you a thoughtful answer. We've noticed each and every computer sounds different when hooked up to the same DAC. The same goes for CD transports. If you're not a believer in transports sounding different from one another then this is where you'll most likely stop reading. That's fine with us. If you feel digital is digital and all digital sources sound the same, we cannot convince you of anything we'll be touching on in this review. That's okay. If you've done the listening and comparisons as we have, you know each digital source is not created equal. 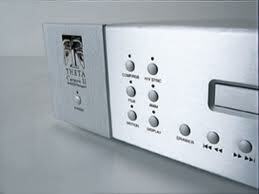 0's and 1's do depend on how they are 'extracted' from each source and streamed to your DAC. The USB cable, the digital coax cable, SPDIF converter (if you choose to go that route), as well as the transport, all come into play and contribute to how your DAC, and ultimately, your entire system will sound. We like to ask the question, "If all digital transports sound the same, why are there so many CD / computer transport manufacturers?" If they're all the same, each transport should sound identical and there would be no reason to shell out big bucks on a transport. The user would just buy the cheapest unit and be done with it. We know folks have been spending big bucks on transports and DAC's for years and it's obvious to us and our customers that digital isn't that simple and straight forward. All 0's and 1's are not created equal. We decided to prove this concept to a few folks local to us in the Boulder area. We set up a comparison of the Core Audio Mini / Kora PS and the YFS Mini / PS-12m and let them decide which source sounded better. We placed both units on our rack and attached two identical V-Link 192 SPDIF converters to each Mini using our YFS 'Split' Reference USB cable. We then used our Reference 75 Ohm coax cable to go from the V-Link 192's to our EMM Labs DAC2X. This was the only way we could level the playing field and actually compare transports and not some other piece of gear in the chain. Once both units were set up and allowed to play for 8 hours, we began to switch back and forth between the two. We told the few folks that were in attendance to listen to both inputs on the DAC2X and tell us which input they liked better. We didn't tell the listeners which input was which. This way we could truly find out which source sounded better without letting any personal bias come into the equation. The blind A-B listening test is the only fair comparison in our eyes. Otherwise, you know which source you're switching to and you already have a predetermined bias in your head. 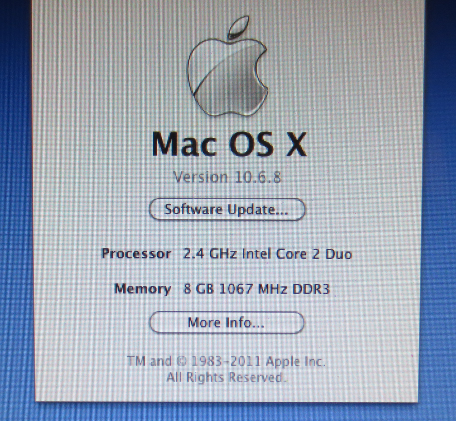 The Core Audio setup consisted of a 2010 Mach2Music Mac Mini with Ryan's internal filter replacing Apple's internal switching PS. 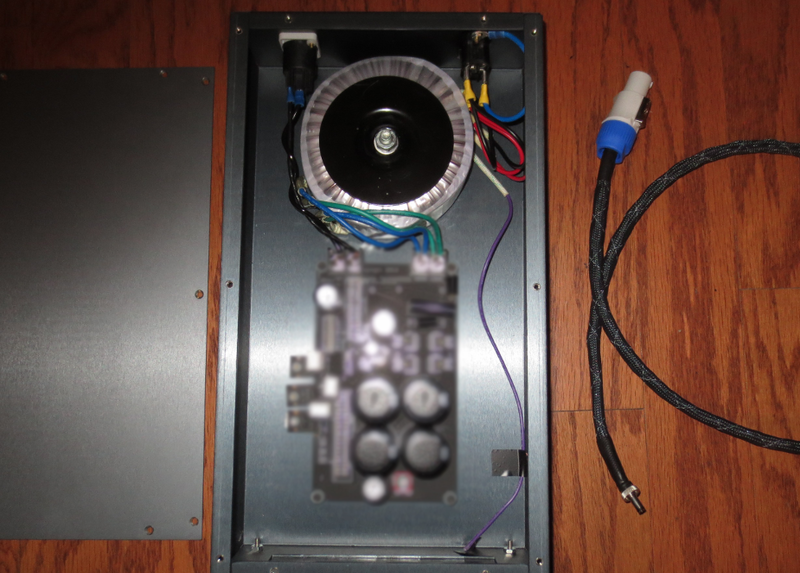 The Kora linear power supply hooked up directly to the rear of the Mini via an umbilical. The digital playback suite consisted of Audirvana Plus (latest version) and FLAC / WAV files were streamed to the V-Link 192 via USB and from there streamed via coax cable to the DAC2X. 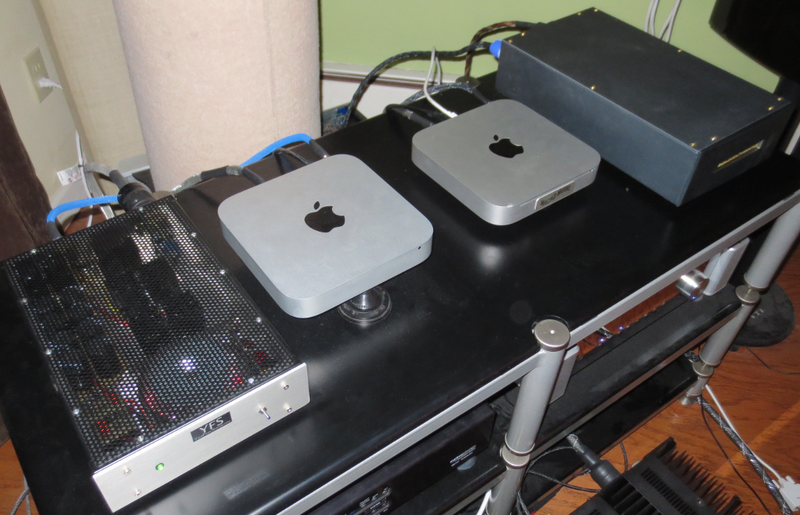 The YFS setup consisted of our 2012 Mac Mini with our YFS version of the internal filter which replaced the stock Apple switcher. 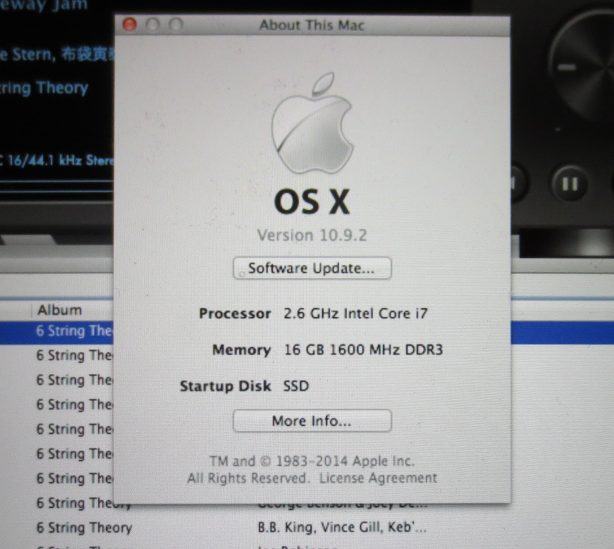 Both Mini's were armed with SSD's for their respective OS X. Our YFS PS-12m linear power supply hooked to the rear of the Mini using our YFS umbilical. The YFS unit was also implementing the Audirvana Plus digital suite (latest version) and all the settings were matched on both units to make things fair. iTunes was disabled in both cases and FLAC and WAV files were auditioned. No DSD was played as we do not have two DAC2X's. The first thing we'd like to note is that after testing each source, we realized they both sounded REALLY good! They should for the money. But, there was a clear winner every time and it was universal which unit was better. Please contact us for the results of our testing. We don't want to make enemies or hurt anyone's feelings and that's not our intention here. This test was done due to popular demand from our customers. We strive to create the best components we can, by hand, here in the USA. We also aim to make all YFS products as robust and well thought-out as possible. It seems to be working. We have received plenty of feedback from YFS Mini customers and we can get you in touch with actual clients if you'd like to hear their opinions. There's never any reason to over-hype things as the proof is in the pudding. Once you get your YFS source component home and you hear it for yourself, we don't want to deal with having to explain why things aren't sounding the way we hyped them up to sound. If we just tell the truth, there are no stories to remember and no lies to live up to. We're not businessmen, we're engineers and that shows in everything we do. Feel free to contact us and we will privately lay out the major differences between our YFS PS-12m, the Core Audio Kora, the Mojo Audio Joule III, and any other PS we've got our hands on. We are engineers during the day and we are YFS creators at night. We are more than happy to show you where that extra coin is going when you purchase our YFS linear PS over the competition's power supply. Drop us a line and we can talk. THANKS for reading and let us know if we can answer any questions you may have about our YFS Mini / PS-12m combo. We're here to help, serve, and spread great sounding digital gear to those who appreciate paying a little more and waiting a little bit longer for 'state of the art' performance. 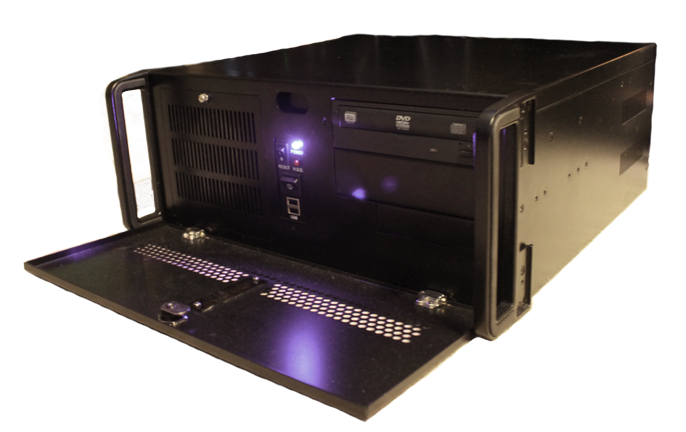 We were able to test our YFS HD.Ref-3 computer transport with the latest SOtM USB 3.0 compliant PCIe output card back in May of 2012. 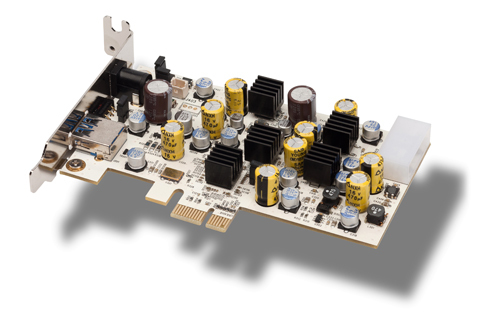 Unfortunately, we quickly returned the card due to its incompatibility with the M2Tech v1 OEM USB input receiver. These USB input receivers are used in a variety of DAC's ranging from Wyred4Sound, Eastern Electric, Chord, Empirical Audio, Metrum Acoustics, Playback Designs, as well as MSB. Obviously, some current and older M2Tech products are included as well, except for the HiFace MKII which uses the XMOS USB input chip. Can we implement a product within our YFS Reference 3 Transport that isn't compatible with several USB devices currently on the market? The very easy answer to that question is, "No". So, we sadly soldiered on using the original SOtM tx-USB card. Fast-Forward to August of 2013. We got our hands on a SOtM tx-USBexp PCIe output card and we gave it another shot. We were hoping to see new drivers packaged along with the card. We were a little bummed out to see the card came with the same drivers we received previously. So, I contacted the man himself, Jesus of Sonore. I described to him how the SOtM exp card works with Windows 8, however, it just won't work with Windows 7. The next day I received an email from Jesus containing a link to the latest tx-USBexp Windows 7 drivers. After uninstalling the current TI USB 3.0 drivers, and then replacing them with these latest ones, everything worked great. AWESOME! This opens up an entire new world for M2Tech, W4S, Eastern Electric, Empirical Audio, MSB, etc. owners! 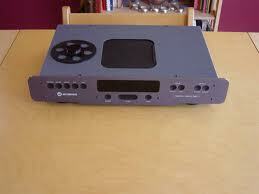 For instance, now we can use our tricked out M2Tech EVO with our YFS HD.Ref-3 transport and live happily once again. 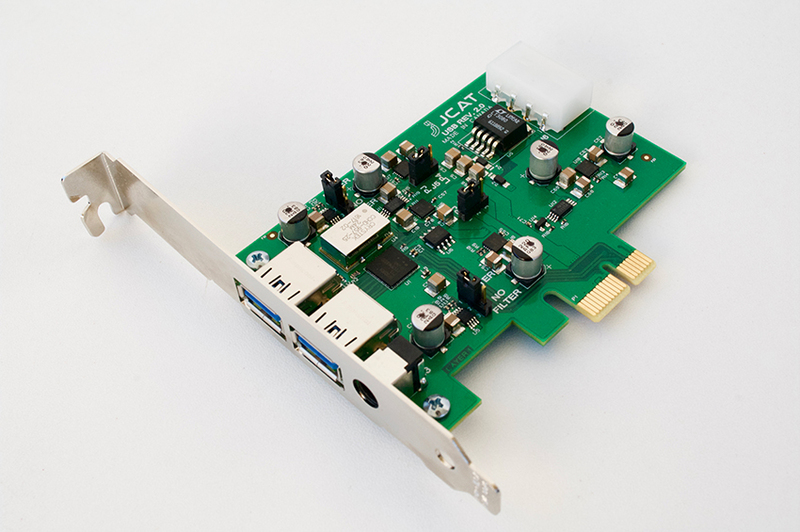 Oh and by the way, the latest SOtM USB PCIe card allows us to not only drop our latency buffers to non-existent values but, it also sounds better than the original! 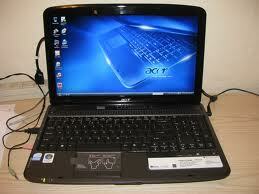 Here is a direct link to the modified Windows 7 drivers!!! We updated our Windows 7 based HD.Ref-3 via the Windows Update website after RMAF 2013 and the SOtM USB 3.0 card is not recognizing ANY of our USB-based devices now. Something tells me this has to do with drivers. As this is usually the case when a fully functioning component stops working after Windows Update. So, we're right back where we started. We know it's due to Windows Update as we only updated one of our Ref-3's on demo in our showroom. The units we did not update are still working fine. It's a bummer but that is the way it goes in the computer world sometimes. We will give further updates as they become available. We recommend using Windows 8.1 in conjunction with the SOtM USB 3.0 card. 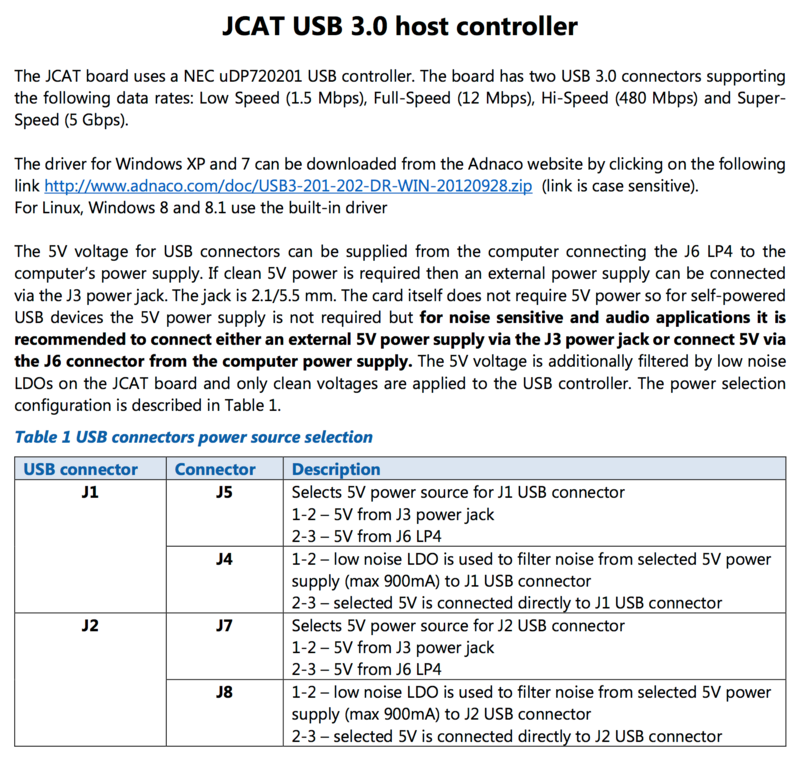 USB 3.0 is natively supported in Windows 8 and functionality is guaranteed with no need for drivers. So, in our last review of the computer vs CD transport, we let readers in on our opinions of both sources. We said the computer was essentially more user-friendly and had a slight advantage in the sound department. 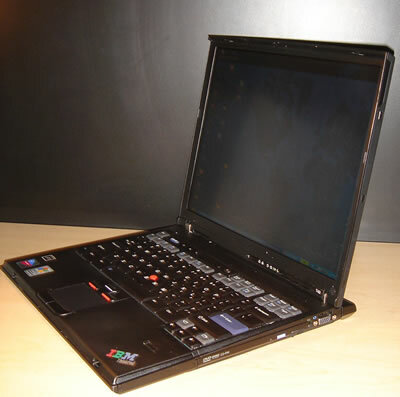 We recently decided to compare computer transports since we have not covered that yet. Fortunately for us, we stumbled on to what we here at YFS believe to be one of the BEST music sources, period. We have heard vinyl playback systems costing well over $120,000 (just the vinyl source equipment) as well as CD playback systems in the same league and I can tell you this is it. Unfortunately, we cannot give you all the details of our computer source because we are still currently in the design phase of our product. We feel it can go head to head with ANY other computer source and BEAT IT, hands down! I know that's a bold statement but once you've heard what we have, we are convinced you'll feel the same way. Let us describe how we came up with our findings and we'll give you some more details on our listening tests and finally the sound. We figured we'd keep everything the same from the previous 'computer vs CD transport' shootout so we are using the original Musical Fidelity V-DAC with USB input and the Acer 5735z laptop. 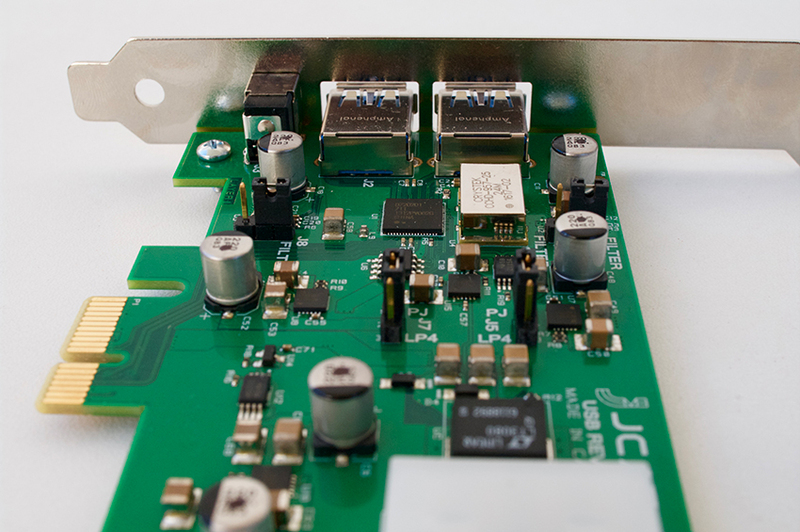 As we mentioned in that review, we were not able to get bit-perfect output via USB based on the V-DAC's design. Apparently, many folks have reported the same issues so we ended up using the "direct sound" mode within Foobar 2K for the Acer. We ripped our CD's to WAV files using EAC CD ripping software. We then set up our custom YFS music server prototype (still in it's design stage) to see what we could find out about this whole computer audio craze. We're glad we did! We played an album on the Acer after letting our system warm up for a bit and then we switched sources. Our YFS prototype was outfitted with Windows 7 and Foobar 2K in "direct sound" mode with all the exact same settings to make the comparison fair. We used the USB 2.0 output as well to try and even out the playing field. We immediately noticed everything sounded better! We're talking a night and day difference here. In fact, we didn't need to switch back to the Acer it was that good. We then realized we were hearing things we haven't heard in our favorite recordings EVER. You are probably asking, "What about your vinyl set-up?" This was definitely on par with our vinyl set-up and even surpassing it after listening for a couple hours. We are very familiar with our vinyl rig's sound and we were immediately impressed with this server! Here's where it gets interesting. We decided we should try JRiver Media Center and see what effect that had on the overall sound in our YFS prototype. Let's just say this was an eye-opener as well. (Unfortunately, the trial version lasts for 30 days and then you must pay the $50 to unlock it) Using the WASAPI playback setting within JRiver, we were able to get a bit-perfect digital signal out of the YFS prototype via our USB 3.0 output and we were literally floored! WOW! I know we wanted to keep things fair at first but now that we knew it wasn't even close, we decided to go all in. 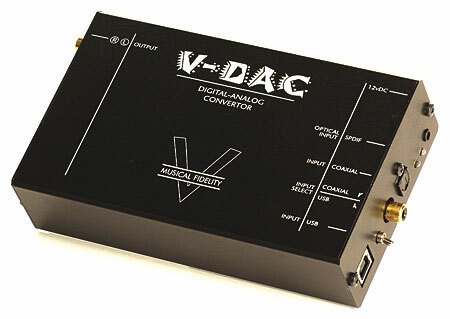 Most folks have not had luck getting the MF V-DAC to play nicely with any bit-perfect playback scenario. After hours of tinkering, I guess we just got lucky. We then cued up the Talking Heads' Speaking In Tongues 24/96 digital files and we almost blew the roof off the joint! INCREDIBLE! Talk about P.R.A.T.! I haven't heard a source with more slam, attack, detail, and good high's, lows, and mids like this ever before. If the end-user was to use one of the many Asynchronous USB DAC's on the market right now, none of this would be an issue. The user would download their DAC's proprietary drivers, install them, and then select that driver under the "Options" menu under "Audio". Then the user would select either ASIO or WASAPI from the same menu and he or she would be on their way to bit-perfect digital music via USB! We then switched back to "direct sound" mode which actually sounded really g ood but with more emphasis on the high end of the frequency response. It reminded me of switching between a tubed CD player and a solid state CD player. VERY COOL. So, we've decided that JRiver is definitely worth your time experimenting with. The user can actually fine-tune the sound he or she is looking for with the various output options available WITHIN the JRiver suite. No need to download and install plug-ins. Again, VERY COOL. Stay tuned for more details about our YFS music server prototype. If we're this excited about something, we figure you will be too. It's just a matter of time! We have been very busy testing our HD-Ref-1 computer music server. We feel it's almost ready to release to the general public. We have a few more odds and ends to clean up and we'll be all set. Contact us for pricing and availability of our very first few units!!! 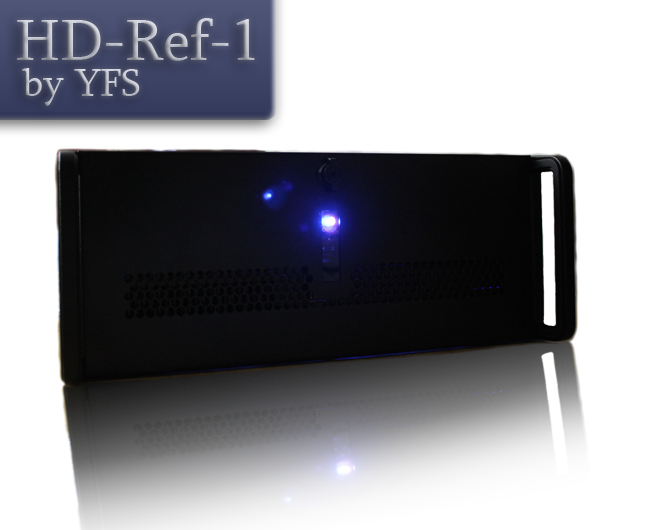 Click here for more information on the YFS HD-Ref-1.